How Many Apple Watch Did Apple Sell? Apple announced its fiscal 2015 fourth quarter earnings today. While they break down unit sales for iPhone and iPad they did not do that for Apple Watch. They included it with iPod and other accessories revenue and report a single revenue number. Arguably unit sales are likely not that great by Apple standards. How do we find out? Fact that Apple won’t report the breakdown should not stop us from estimating it probabilistically. Here I will give you estimates at 3 confidence levels for Apple Watch revenue. Based on possible average selling price of ASP the unit volumes will vary. Let us start way back in Q1-2013 when there was no Apple Watch (it was introduced in April 2015, and this is the first full quarter of Apple Watch sales). Looking at financial reporting by Apple we have access to revenue from iPod and accessories. Until 2014 Apple reported iPod separately but combined them all as Other Hardware (Apple TV, accessories etc) since 2015.
iPod sales was on the decline for a while, with the last reported number at Q4-2014 at $410 million. Let us extend that trajectory to the rest of 2015. 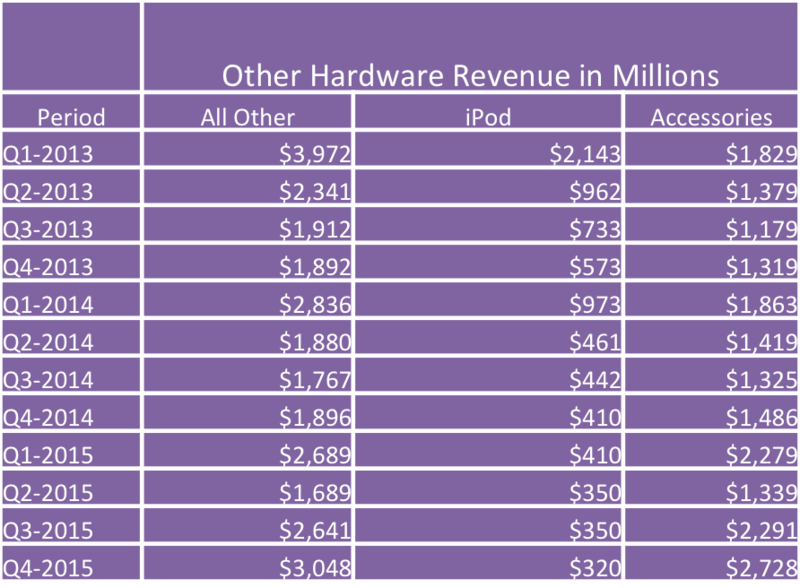 Here is the past twelve quarters of Other Hardware revenue with breakdown of iPod and the rest. And a chart version to see the trajectory and mean values. You can see the Accessories revenue (sans iPod) bounces around a mean until the quarter Apple watch was introduced. During those quarters the mean of Accessories revenue was $1,541 with a standard deviation (sigma) of $340.5. In Q4-2015, the just reported quarter, Apple’s Total Other Harware revenue is $3,048 million and excluding iPod it is $2,728 million. What the standard deviation tells us is what portion of this $2,728 can be attributed to Apple Watch. That is a probabilistic prediction at three different confidence levels. We are over 97% confident that Apple made just $505 million from Watch but we are 50% confident the best case is $1,186 million. Now to the unit sales. We have to model this for different average selling price (ASP). I am guessing the range is from $400 to $600 with very few if any of $18,000 unit sold. 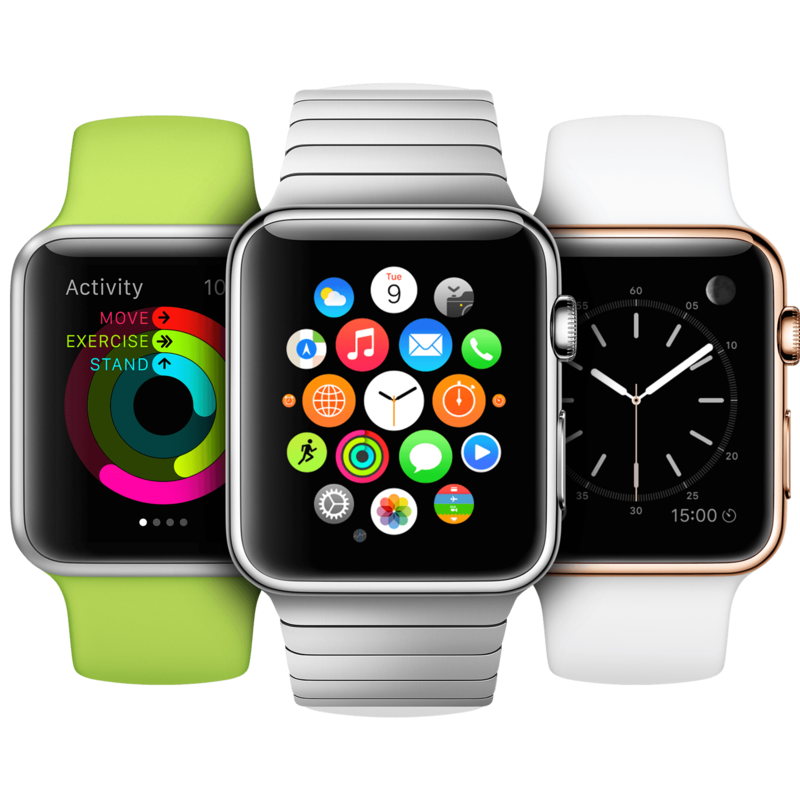 So here it is Apple Watch sales at three different confidence levels. I predict with 97% confidence Apple sold about million Apple Watches this quarter. Not a big number compared to iPhone volume.